The one thing that is very apparent with the latest development from Lexus of its hugely successful luxury crossover brand is that it is big. Of course it needs to be in transporting seven people and their luggage. This motor is a real top-quality seven-seater and not just seven basic seats and a tiny space for baggage. Those looking for a luxury SUV are well catered for, with the latest generations of Audi Q7 and Volvo XC90 both bringing fresh offerings to the market, competing with various Range Rover models for dominance. The Audi and Volvo now have hybrid powertrain models available for the first time, but Lexus has more than a head start with various models since 2005. Everything about this Lexus is luxury, with a leather interior throughout and even the middle seats offering a warmer. It is the details that count, even with the press kit, a quality production including a USB stick built into the presentation booklet. Most impressive. Modern cars are complex pieces of machinery. It is not just a question of putting a key in a slot and driving off. With a week’s loan, normally perhaps 250 miles of town and country driving, trying to learn all the buttons is not easy. The simple driving comes along without any trouble but learning where all the special controls are is a mammoth task best done with a co-pilot who can apply some technical knowledge. The Lexus 450 is four-wheel-drive. While for most it is a source of comfort and used only in an emergency, a quick run over a fairly sticky field showed tremendous capabilities. It is a tall car and one does look down on the rest. But saying that, it is easy to get in and out of for the shorter person and there is an electric tailgate. The sat nav on this car is much the same as that on a five-year old Lexus. That is a big plus if your own car is a Lexus, but the 12in screen now also offers a set-up display with a single panel (full map), two-panel (half map, half information), or three-panel (half map, two information screens) view. Operation is by means of a rotary remote touch controller that is fiddly. There is a head-up display that is contained within the driver’s console, a safety approach to navigation. BTN is unashamedly a fan of the true hybrid which is self-charging. If you are stuck in a slow-moving convoy, your fuel consumption improves. Amazing. But don’t believe the manufacturer's figures for this car; the supposed 47mpg in town and country came down to 30mpg, still a very good figure for a vehicle that weighs in at 2,250kg and is 5m long. 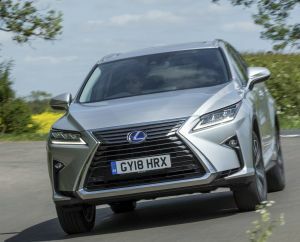 Lexus has refreshed this fourth-generation RX SUV with two engine options – the 3.5-litre V6 petrol hybrid (also known as the RX450h) and the new-to-the-line-up turbocharged 2.0-litre petrol engine (the RX200t). The RX is not the quickest, with a 0-60 of 8sec regardless of the motor, a near-silent cruising speed of 70mph, and a maximum of 112mph. It is the back end that deserve a lot of interest, extending the length behind the rear axle but still keeping the shape. Although only 110mm longer overall than its predecessor, the RX L makes excellent use of the additional space to ensure everyone on board can travel comfortably and that the third-row seats have easy access. This accommodation, while OK for adult short trips, is really designed for children and here we have a major gripe. Power operation allows the rearmost seats to be raised at ease and the car has a triple-zone air-conditioning system with independent controls at the back. Kids love pushing buttons. Lexus, please save a few pence and leave out the electrics for row three. In a short road review, it is impossible to point out all the features, many of which one has come to expect even on less luxurious cars. The steering wheel moves when the ignition is switched off (or on) to give more space getting in or out. The self-folding mirrors are also coupled to reverse and move to compensate when backing up, a small but most useful innovation. You can set the seat to allow two (or even up to four) drivers to press a button for their preferred driving positions. The front passenger has the same luxury. Perhaps it is the 20in wheels, but the car seemed much happier on the bumpy local roads than one is used to. As a SUV, it is designed as an ‘off-roader’. Being cynical, perhaps that is the answer. On the motorway, all the ‘smart’ features come into their own, including the Adaptive Cruise Control, which helps the driver maintain a safe distance from the vehicle in front and reverts once clear to the pre-set figure. This also functions as a pre-collision system to detect vehicles and pedestrians on the road ahead. The Traffic Sign Recognition system uses a front camera to recognise principal warning and command signs, which are then replicated on the multi-information and head-up display, reducing the risk of the driver not being aware of speed limits, lane closures and other important information. There is blind-spot monitoring and also lane assist, which hoots when deviating in any way off the centre of the lane. Sway Warning performs much the same function. One is tempted to switch both off. Once you have arrived at your destination, the parking assist monitor comes into its own. But do realise this is a big car and needs a big space. There are controls for the adaptive suspension and performance settings called “Sport” and “Sport S”, but whether they are used in normal driving is open to discussion. 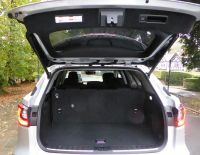 At the end of the day, the RX is a large station wagon and built for purpose. For sporty cars, try a Lexus RC. There is a wireless smar phone charger, USB points and an electronic key entry system. Decent-size cup holders too, small details that go to make the Lexus RX 450hl L a fine up-market family SUV. With a sunroof and metallic paint, she came in at £55,735.